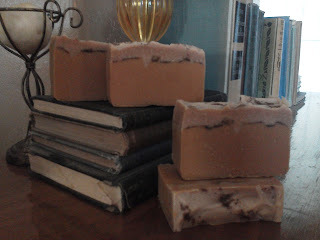 I had a blast creating this soap recipe! It's a great combination of oils, milk, honey, fruit and vegetable purees, and not as hard to make as it sounds. only. I wanted the natural scent to come through. Topped with a dusting of cinnamon. This was done the cold process method. For the carrot layer I used 7 oz of carrot puree and 6 oz of fresh, raw goats milk that I had frozen in ice cube trays, for a total of 13 oz liquid. 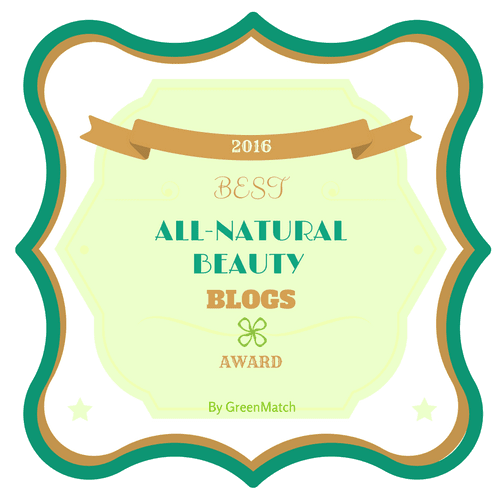 Olive oil, moisturizing oil that allows the skin to breath, softens skin, won't clog pores. Coconut oil, lovely, lovely coconut oil. Ah....moisturizing, soothing, protecting. Shea butter, made from the nut of the Karite tree that only grows in Africa. The beautifying shea butter battles skin thinning, helps in collogen developement, decreases wrinkles caused by sun, diminishes appearance of scars, stretch marks, cracked heals. It's a soother after shaving, high in Vitamins A and E. A great addition to any luxury bar of soap. reaching the lower layer to repair and moisturize, leaving your skin feeling SO good. A strong presence of antioxidants that fights free radicals plus an abundance of vitamin E make cocoa butter irreplaceable. In soap, it helps to make a harder bar. Honey, antioxidant, antibacterial, naturally moisturizing, beautiful honey! purees into your soap, just comment below and I will be happy to oblige! Wow! This is a great looking bar of soap! You are doing a great job! To Amy: Hi, isn't soaping SO much fun! Using purees is alot of fun, and not as hard as you'd think. I don't puree my own, I use baby food. It is a smooth puree, and the work is all done for you! Ha, love it! I found a great YouTube video tutorial by Bathmistress, who shows you how to make carrot and buttermilk soap using carrot baby food and buttermilk frozen in icecube trays. So, being a true Soaper, I tweaked the recipe to make it the way I wanted it to be, and applied her ingenious method. I've used baby carrot and baby applesauce, worked like a charm, just make sure you freeze your liquid of choice ahead of time in ice cubes. You'll see why as soon as you watch the video(s), there is a part 1 and part 2. I think I'll try banana baby food next, lots of great "stuff" in bananas! Tomatoes are great for the skin also, if you are so inclined, you can use tomato juice as a liquid to make a nice, natural facial bar. 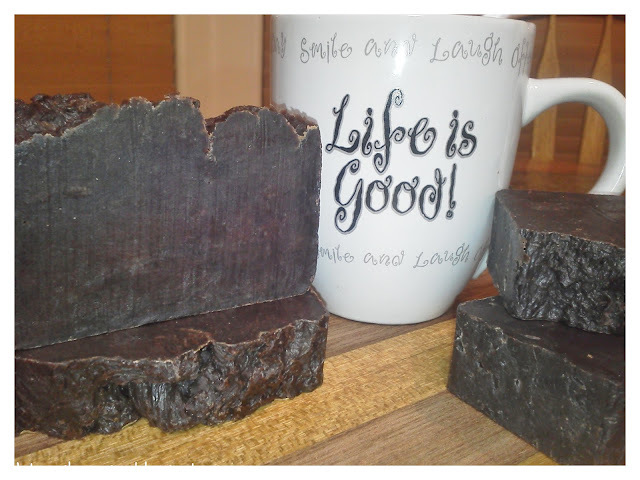 If you get the chance check out my other posts about soaps, I have a great, easy 3 oil recipe for hot process coffee/cocoa soap, with a full tutorial. This is a really great soap. Let me know how it goes! Have fun! Thank you so much for the details. I actually haven't made any soap yet. A friend of mine and I are getting together next week to do our first batch. I've saved your coffee/cocoa recipe, and that is also on "the list" to try! This recipe sounds wonderful! I've used pumpkin puree & fresh cucumber puree in recipes with great success. Can you provide more detail on the recipe? How much lye & water did you use? Did you use equal amounts of the oils? 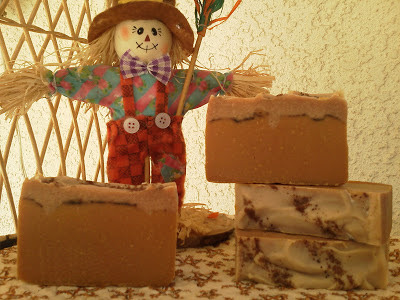 Hi Cathy, thanks for the interest in the apple/carrot soap recipe. 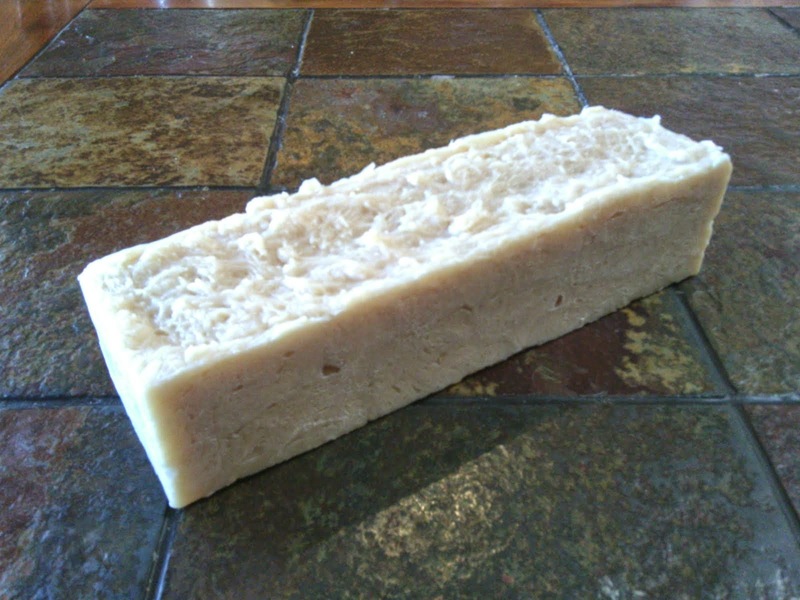 It really is an amazing bar, great lather, not drying to skin at all. Just lovely. This is the ingredients for the bottom layer of carrot soap, I made a smaller batch of the same recipe and added the apple in place of carrot to make the top layer. I've made this same recipe hot process with finely ground oatmeal added at trace and it came out really, really nice. 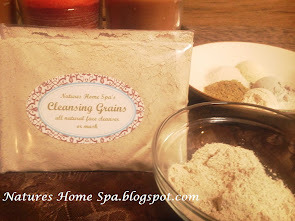 Great facial soap. Thanks so much for the recipe! For my cucumber soap I used 5 oz canola, 10 oz coconut, 9 oz olive, & 7 oz palm oil, and 1.7 oz shea butter. I used 4.6 oz lye & 6.7 oz water. I half peeled a good sized cucumber & threw it in the blender on puree with a bit of the oil. Just enough to help it all move around well in the blender. In making it again, I would use less water than I did this time because it set VERY slowly. I thought it was never going to get out of the gel stage! I also added some freshwater cucumber fragrance oil, but I think I will leave that out next time as well & maybe add some essential oil (maybe peppermint). It's a very refreshing, soothing soap. 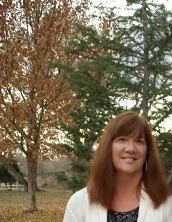 Cathy, thanks for the info on cucumber soap, I really want to try it! Sounds great for the face. Did you add the lye crystals directly to the cucumber puree? I forgot to ask..Can I use liquid carrot juice and when do I add it into the soap mixture?